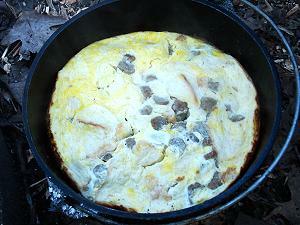 Cut or tear the sausage into little pieces and dump into dutch oven. Peel and shred or dice potatoes to make hash browns, and then add to dutch oven - Or just add frozen hash browns. Stir and fry until hash browns are browned, about 10 minutes. Remove dutch oven from coals. Mix eggs in a bowl or zip-loc and pour over top of potato/sausage base. Cover dutch oven and add coals to the lid to Bake for about 20 minutes. When eggs are cooked, sprinkle cheese over them, replace lid, and cook for 5 minutes to melt cheese.